Tom Jones, based upon the Academy Award Winning film,is about the story of a young man, abandoned as a child, and now all grown up and launched into the bewildering romantic world. female attention and romantic complications. Will these misadventures permanently jeopardize his chances with Sophia? An ensemble consisting of James Brady, Kristen Brownstone, Jeff Heyer, Julie Hughett, Scott McQuiston, Jill Miller, and Equity guest artists Jessica Powell and Jonathan Williams, appearing as the dozens of characters who take part in Tom’s hilarious story. Set Design is by Patrick McEvoy, Lighting Design is by Emma Satchell, and Costume Design is by Babette Garber-Wilson. seniors over 65, and active military. Tickets are available online at: www.PacRep.org, by calling (831) 622-0100, or by visiting the PacRep Box Office at the Golden Bough Playhouse, located on Monte Verde between 8th and 9th, in Carmel. 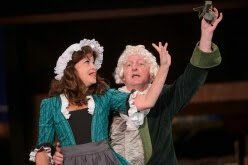 PacRep’s annual Forest Theatre offering is a rollicking and naughty adaptation of Henry Fielding’s ribald classic Tom Jones. Abandoned as a child to the care of Squire Allworthy, Tom Jones is now all grown up and launched into the bewildering romantic world. He falls madly in love with the virtuous Sophia Western — but Sophia’s father is determined to keep the two apart. In this satirical romp, I will be playing Squire Allworthy—could one ask for a more noble part?— the adoptive father of the perpetually baffled Tom Jones. I may play one or two other parts as well. Based on my past experiences with adaptations at PacRep I expect this one to be a lot of fun.